5 Ways to Exercise as A Family | Move your Assets! Consider making this one a ritual, whether you prefer to work up an appetite, or walk off a full stomach. Either are both great for not only exercising as a family, but also for catching up on each other’s day-to-day life. Whether it’s a stroll around the neighborhood, trip to the park, or hike up your favorite trail, consider scheduling this into the calendar at least once per week – during the holiday season and beyond! Watching the game this holiday? 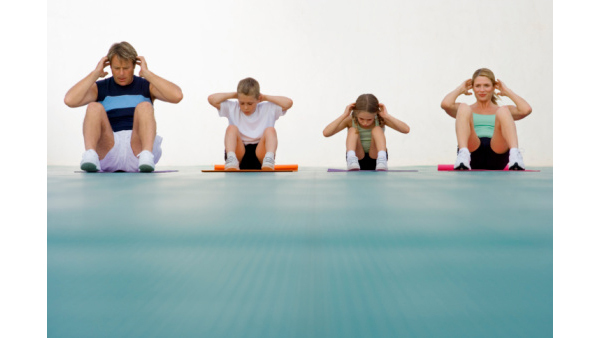 Take advantage of all those commercial breaks, and turn them into fitness games. Challenge each other to basic floor activities, like sit-ups, push-ups, jumping jacks and lunges, and get creative with how each fitness feat is carried out. Who can hold a plank for an entire commercial break? Which family member can do more lunges in between show time? For longer breaks, like a halftime show, consider stepping outside for a few to throw around a frisbee or play catch. Free form fitness, via “toys” like hula hoops, jump ropes, and pogo sticks, can sometimes be the most mindless and encouraging way to exercise, especially for the little ones. By keeping a few of these items on hand, you’ll facilitate unstructured healthy activity on a daily basis, but be sure to remind the adults to lead by example. Remember, you’re never too old to have fun in the name of your health. Care for a game of ping pong, anyone? Set aside a time each week to get the whole family together for a game. Whether it’s kickball, bowling, basketball, or a 15-min. 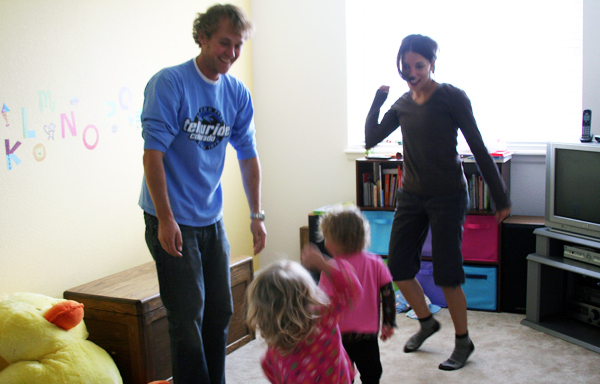 session of partner yoga, mix it up from week to week by letting each family member choose a new theme each time. For the holidays, consider an active version of Charades. Encourage each family member to throw a few clever, exercise-required ideas into a hat, and get acting!